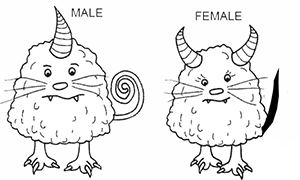 In this activity, you will examine how two traits are inherited in fictional animals called hornmonsters. The genes for these traits are located on separate chromosomes and are inherited according to the following rules. One horn is dominant to two horns. Curly tails are dominant to straight tails. 1. For each genotype below, list the phenotype. 2. 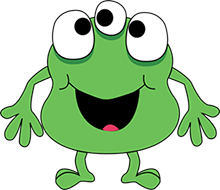 If you crossed a hornmonster that was homozygous dominant (HHTT) for both traits with one that was homozygous recessive for both traits (hhtt), what is the genotype and phenotype of the offspring? Set up a Punnett square that could be used to determine the ratio of offspring from that cross. Why does a Punnett square work? When you put the parent’s genotypes on the top and side of the square, you are showing how each chromosome combines with the other chromosome during the formation of egg and sperm. 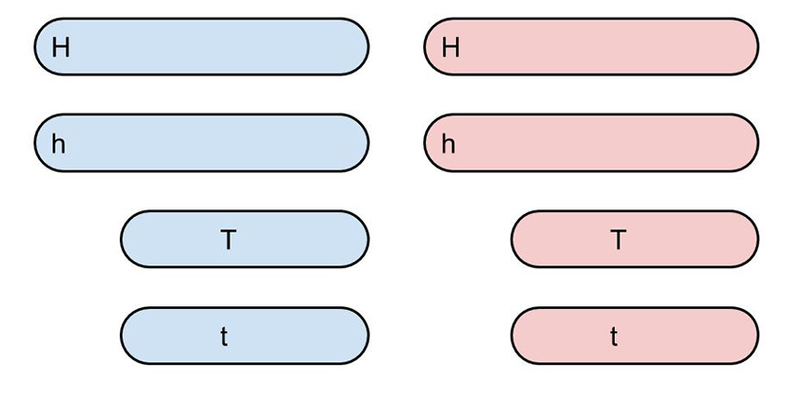 For example, some sperm receive an HT combination and other sperm receive and Ht, or hT, or ht The same combinations occur when the female makes eggs. This principle is called INDEPENDENT ASSORTMENT: or alleles separate during the formation of gametes. 1. 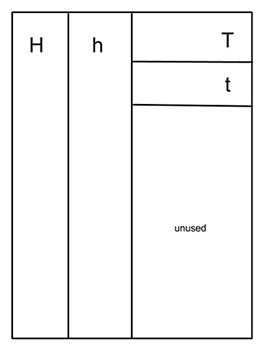 Obtain blue paper and cut four strips, two long and two short, as shown in the diagram. 2. Add the alleles to each chromosome. The horn (H) allele is located on the long chromosome and the tail (T) allele is located on the short chromosome. 3. Repeat this process using pink paper to represent the female set of chromosomes. 4. Place your papers face down so that you cannot see what alleles (letters) they carry. 5. Choose a long chromosome from each set randomly (pink and blue). 6. Choose a short chromosome from each set randomly (pink and blue). 7. Flip the papers over to see what genotype your offspring has. 8. Replace your chromosomes in the original pink and blue set and repeat this process to complete the table belong. You will have 16 offspring. 10. Review your Punnett square from #3 on the first page. How close are your numbers from the crosses you did with paper to what you predicted with a Punnett square? How would you account for any differences? 12. Consider a new model with a related creature called the Snarlap. A Snarlap with three eyes (Ee) and purple tongues (Pp) is crossed with one that has two eyes (ee) and yellow tongues (pp). Sketch how you would set up your slips of paper to model this cross.